For instance in 1813 a Dutch beer seller in Amsterdam advertised ‘a set of genuine Brabant beers’ including brown uitzet from Gent, Bosscher, Peterman, white Leuvens and Vilvord. And it’s only the top of the iceberg. So, in the next few posts, I’ll have a closer look into lost beers from Belgium, because despite all the wonderful lambics, saisons and oud bruins there’s also a lot of tradition that has been invented out of thin air, while you never hear about the real historical beers. Take uitzet, of which a few old recipes are readily available. Here’s one written over two centuries ago. In the summer of 1798 the Gent physician P.E. 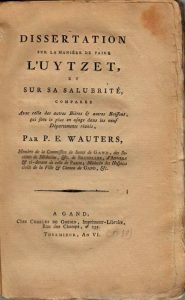 Wauters wrote his ‘Dissertation sur la bière appellée Uytzet’ in which he explained how uitzet was made, and why it was such a healthy beer that it was to be preferred over other beers and wine, water, coffee and tea. According to Wauters, uitzet was invented in the year 1730 by brewer and innkeeper Van Petegem in the town of Wetteren on the Scheldt river. One day he found out that he had almost run out of brown beer, a beer that was usually hardly fermented at all, and only clarified after a long boil and a long wait. Pressed for time, he took a beer that had only boiled for five to six hours (instead of the usual thirty to forty hours) and had it ferment very heavily. Within three days it was clear and drinkable. In the appendix to Wauter’s book the uitzet from Wetteren is described as very clear, brownish yellow and with a fresh, slightly sweet taste followed by an agreeable bitterness. Uitzet was made of barley (preferably winter barley) hops (preferably from Aalst) and of course water and yeast. Wauters described the brewing process in detail, and one of the things that stand out is that the yeast was not added all at once to the cooled down wort, but instead the beer was poured bucket by bucket into a small fermentation vessel. When the fermentation vessel was about to run over, one simply removed some of the fermented beer and then added more unfermented wort. After that, there was a second fermentation in the vats. According to Wauters, one of the reasons why this beer was so healthy, was that the recipe was simple. So simple, that you just had to work with good ingredients: there was no way to hide bad quality grain or hops. To him it was therefore completely obvious why the 1791 epidemic of dysentery was so disastrous in the town of Dendermonde and surroundings: there people drank white beer. The uitzet drinking town of Wetteren was however spared by the disease. The good things beer can do for you. 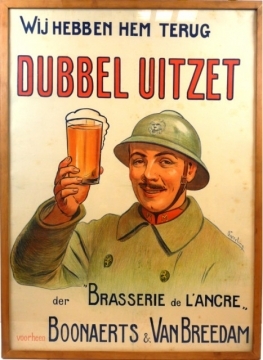 During the 19th century, uitzet, especially the uitzet from Gent, was one of the most popular beer types of Belgium. It was even drunk and imitated across the border in the Netherlands. In 1842 the Moriaan brewery in Middelburg advertised an uitzet they had made, and in 1844 a brewery in Vlissingen had hired a ‘knowledgeable Flemish master servant’ for this purpose. Many other Dutch brewers followed, and it was made in Gorinchem and Breda as late as 1887. Apparently, there were two variants of uitzet: an ordinary one and a double uitzet. In 1851 Georges Lacambre, a French brewery engineer working in Belgium, described the difference: for double uitzet more malt and hops were needed, it was only brewed in winter time and it was stored longer. A brewer from Gent had told him that with 26 sacks containing 165 pounds of malt each, one could make 5440 litres of double uitzet; and with the same amount you could brew 8000 litres of the ordinary uitzet type. Double uitzet had an ABV of 5,5%, single uitzet was 4%. ‘Fresh and healthy uitzet comes from the cellar, its white collar suits him extremely well’, as Gent-based poet Napoleon Destanberg sang in 1862, in a song of which the refrain went like this: ‘Uitzet from Gent, you do us well, you pour strength and joy into our minds.’ And yet, the uitzet must have disappeared from circulation in the first decades of the 20th century. How exactly? Why? I haven’t found out yet, and I’m sure there’s more to uitzet anyway. I guess I just have to continue searching. If you’re interested in grabbing a pint of uitzet, you could just go to Wetteren. Since 1996 local microbrewer Paeleman is making uitzet again, though now described as a bitter triple with a hint of coriander at 6,8% ABV. That doesn’t really sound historically accurate, but I guess it still tastes nice. Below is the recipe of uitzet as described by Wauters in 1798. Somehow it feels a bit off (why do they make the small beer from the first mash? ), but you still could give it a go. Lacambre also discusses its brewing process, and I’m sure there are more uitzet recipes to be found. For now, this one will have to do. From: P.E. Wauters, Dissertation sur la bière appellée Uytzet, Gent 1798. First, fill a large vat with water, which we will call vat A. Then, put on the fire under the kettle, which also contains a certain number of barrels of water. 1. Cover the false bottom of the mash tun with straw, of at least one thumb high, and put three or four mash rakes on top of it, at an equal distance from each other. 2. Spread the malt on top of it. 3. Through a wooden pipe, which passes through the false bottom, pour six buckets of boiling water from the kettle. 4. Then, through the same pipe, pour 9, 12, 15, 20 buckets of cold water, taken from vat A. Then another bucket of boiling water, and then another 9, 12, 15, 20 buckets of cold water, and so on, alternating hot and cold water in the same proportions, depending on whether the weather is hot, until a quantity of 9 to 10 barrels is reached. 5. Slowly mix the malt with the water, until it’s completely wet. 6. Extract this water first, and put it aside in vat A, to make small beer. Our brewers call this the ‘slyme’ (slime). 7. Pour 16 or 17 barrels of boiling water from the kettle into the mash tun. 8. Put the slime into the now empty kettle. 9. In the mean time, stir the grains firmly and intermittently, and mix it carefully with the water, for at least one hour. Do it so that the malt, now called ‘fardeau’ (‘load’) is perfectly wet, and as soaked and liquid as possible. 10. When the ‘load’ has sunk onto the false bottom, remove the wooden tap and let the liquid run off. The liquid streams into a recipient vat. This liquid is called ‘stuykwater’ in Flemish and ‘les métiers’ in French. 11. Pour this, still warm, into vat A onto 25 to 30 pounds of hops, and let it soak. 12. Pour the boiling slime onto the ‘load’ for the third mash. 13. Let this mix together well. 14. The ‘load’ still resting on the false bottom, extract the slime and infuse it with eight to ten pounds of hops, in vat A (like the Uytzet no. 1 in point 11). 16. Increase the fire under the kettle and keep the infusion (point 11) boiling for eight to nine hours. 17. Once the uytzet has been put into the coolship, fill the kettle with the slime and its hops (point 14). 18. This is also boiled for eight to nine hours, and is then treated the same way as the first uytzet. 19. Once the uytzet has cooled down enough relatively to the atmosphere temperature, pour it into a large vat called B. 21. Once this is done, mix the yeast floating on top with the beer again and proceed with vatting. 23. Once these fills have been done, close the vats, usually 36 hours after vatting, but only if the beer is well calm or the secondary fermentation has well calmed down. 24. Start and stimulate the fermentation of the small beer by adding a bit of ‘pied de levain’. 25. Keep the beer in cold, dry, clean and well-aired cellars, to which sun beams have no access. We have now seen the principal rules to which one needs to pay attention to obtain this good and healthy beer, which can be kept for several years, even in barrels, and in bottles even much longer. This article was based on an earlier version in Dutch, http://verlorenbieren.nl/verloren-bieren-28-uitzet/. P.E. 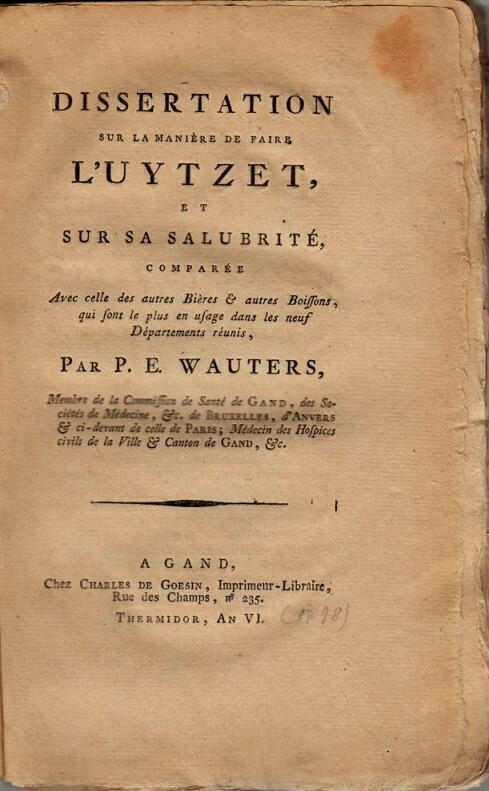 Wauters, Dissertation sur la manière de faire l’Uytzet, et sur sa salubrité, comparée avec celle des autres bières et autres boissons, qui sont le plus en usage dans les departéments réunis, Gent 1798. Middelburgsche courant 28-4-1842, 19-3-1844; Algemeen Handelsblad 20-4-1887; De Tijd 4-10-1887. Georges Lacambre, Traité complet de la fabrication de bières et de la distillation des grains, pommes de terre, vins, betteraves, mélasses, etc., Brussel 1851, p. 306-310. ‘Het Gentsche Bier’, in: Ghendtsche tydinghen, 8e jaargang nr. 1 (januari 1879), p. 24-25.